To help you avoid falling in their best designed traps, this page is updated on regular basis with latest and top online scams techniques used by scammers to trick you. For more information on how to protect yourself online, spot scammers and report them, please visit our FAQ section Scams and Safety. 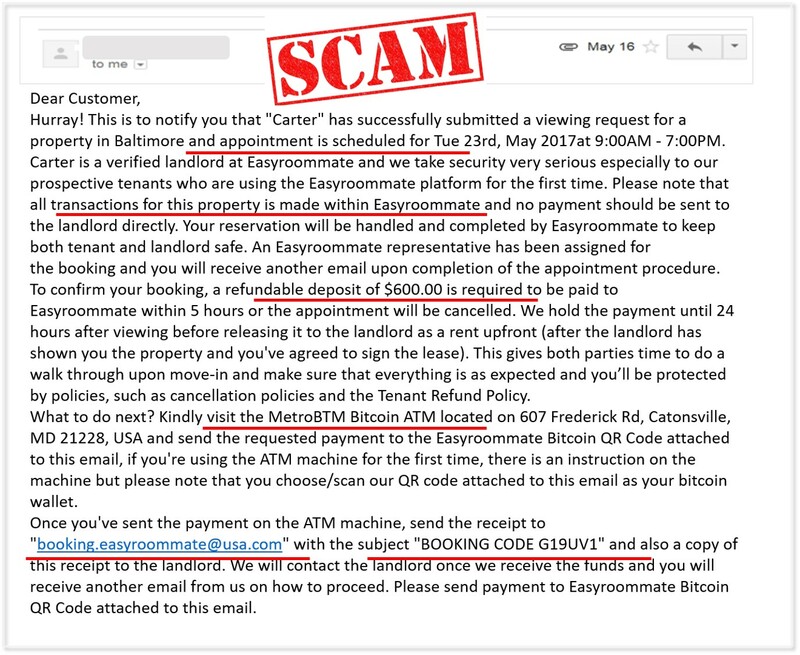 Similar to "booking.roomgo" scam, these fraudsters will contact you directly via email or on text messages to convince you that it's part of Roomgo's protocol to wire money as a reservation to view the property. This is definitely a scam and this is not part of Roomgo, we do not interfere in any sort of arrangements between members and we are against sending money to anyone you have not personally met. Unfortunately some scammers prey on people looking for rooms by pretending to be " Part of Roomgo" under the name of "Registered landlords". They tend to contact the users through personal emails or WhatsApp using fake templates and email addresses pretending to be Roomgo to convince the victims into wiring a certain amount of money as an upfront refundable deposit to view the property. This is not a safe process to find a room and this is not part of Roomgo. We do not have agents or registered landlords, as we do not do bookings, the members on the site (landlords and tenants) post their ads to find a suitable match and we simply help hosting ads for both parties. In order to appear more legitimate towards their victims and gain their trust, online Scammers tend to use the identities of real people. The scammers in this category generally claim that the nature of their job affords them no opportunity to make any direct contact with you, except emails. This way, you will end up with someone who has not even met you, who has not even seen the room, wanting to send you a lot of money. They will ask you to provide your personal information for printing on a fake cashier’s cheque or ask you to open a PayPal account for the transfer of the funds. 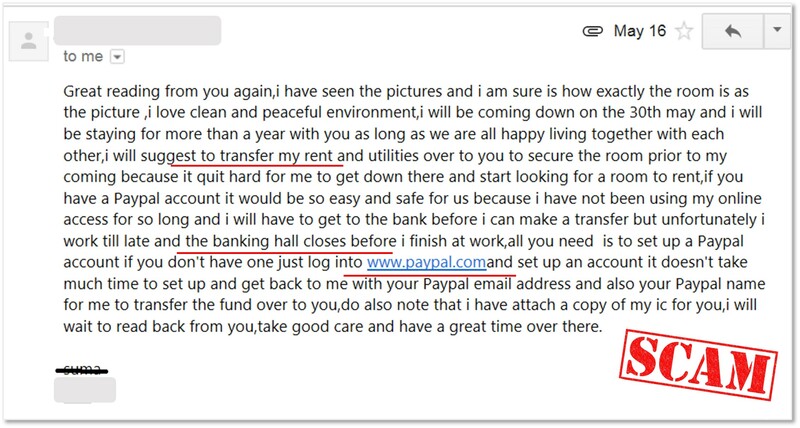 The scammer will insist that they can only use PayPal and will even send you fake emails that pretend to be from PayPal to confirm the receipt of the funds. They will then claim that the funds they have transferred are much higher amount than your asking price, because he or she made a mistake and hope that you’ll send back legitimate money before you realise the whole transfer was fake..
Below you will find different examples or but for the same scheme. 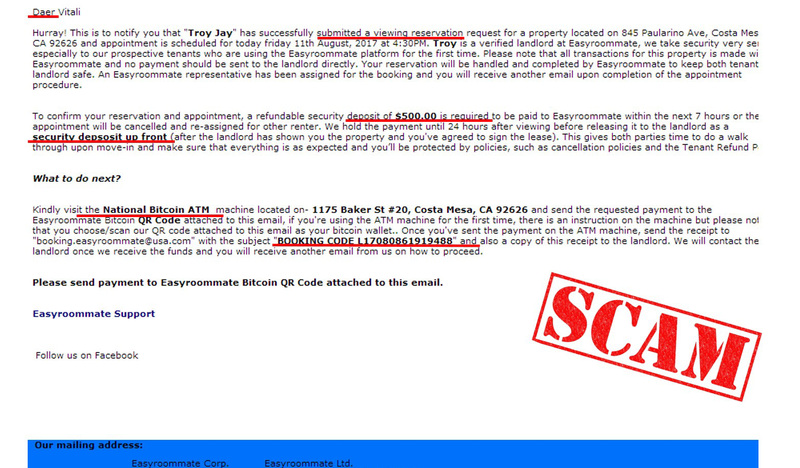 A fake Roomgo representative will contact you via email in order to “ book” a viewing or a room for you. They will then ask you to make a payment and send you a link for this purpose. They can also redirect you to a fake website similar to booking.roomgo.com or booking.roomgo.europe. This is a known scam in USA, but these techniques can be used anywhere around the world.